The more I see of this man’s work, the more I admire it. 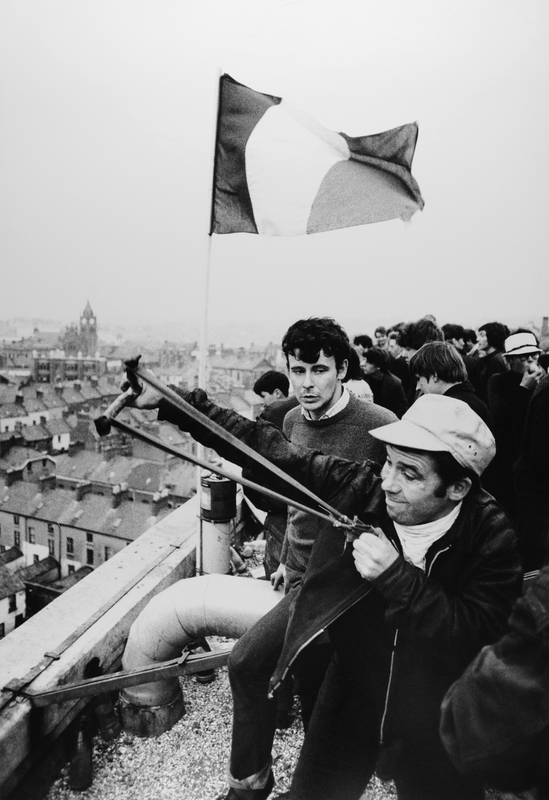 A sense of history, truth and injustice; a sense of beauty, colour and disenfranchisement; above all, a sense of composition and knowing the right time to take a photograph to tell the story. 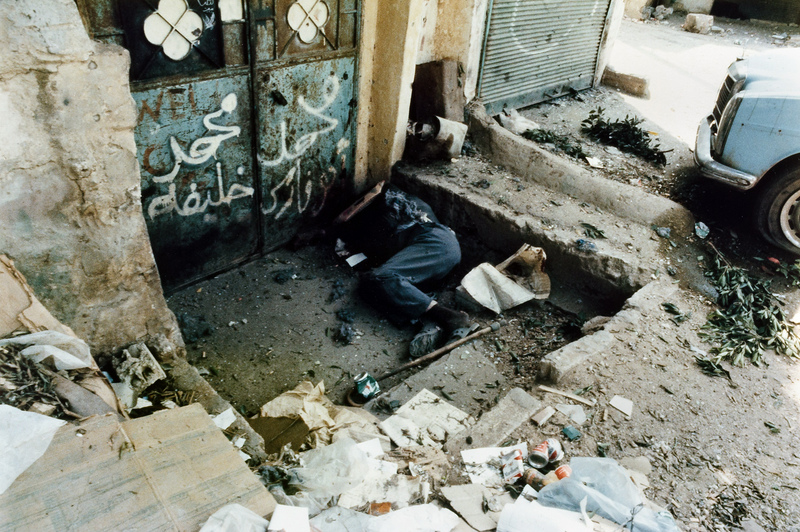 It’s all there, right in front of us, in almost every photograph. 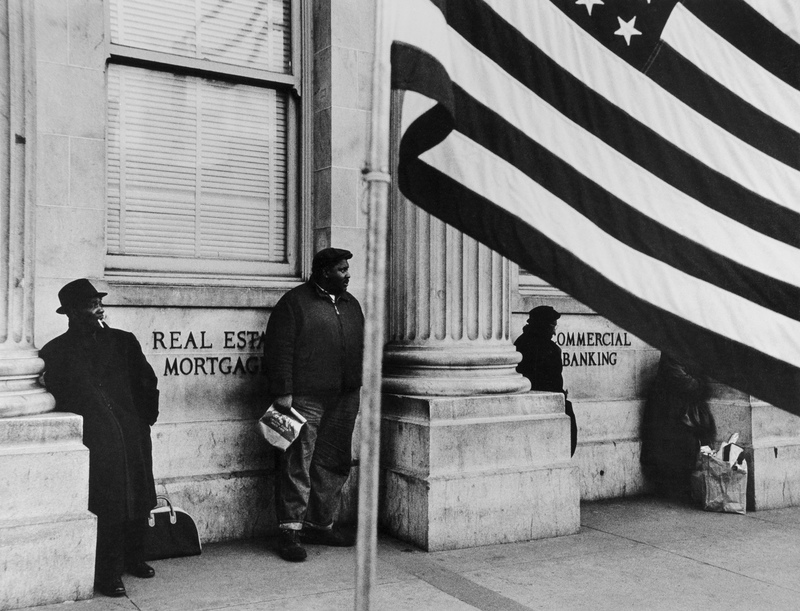 Photographs of institutionalised racism and the American apartheid, “the state of being apart”, laid bare for all to see. 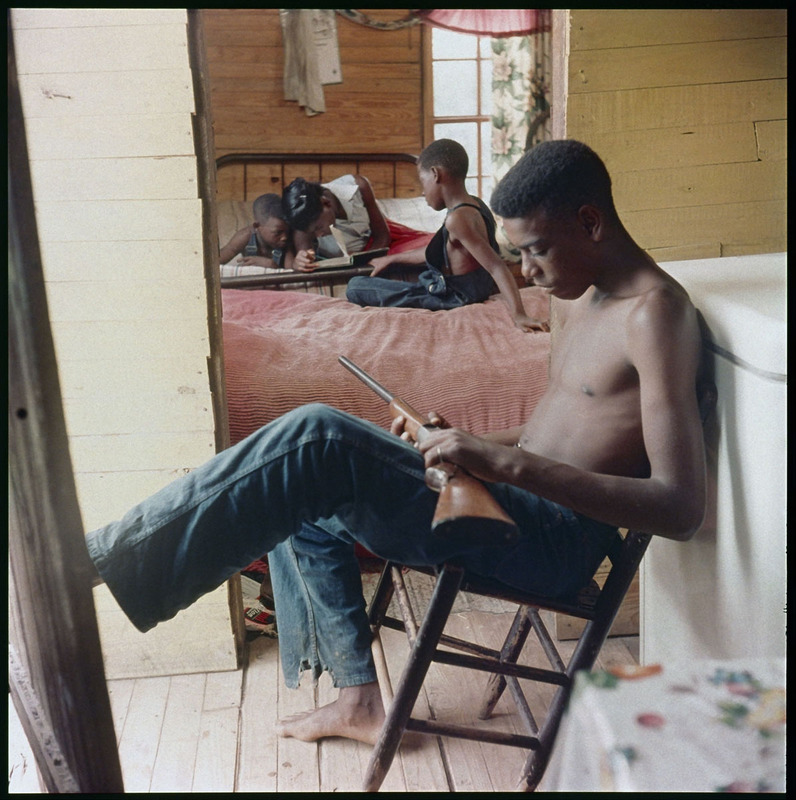 But then we have two of the most intimate moments of beauty that brings me to tears as I write this, the two photographs at the bottom of the posting Untitled, Shady Grove, Alabama (1956). Just look at the light that Parks uses, this drawing with light. 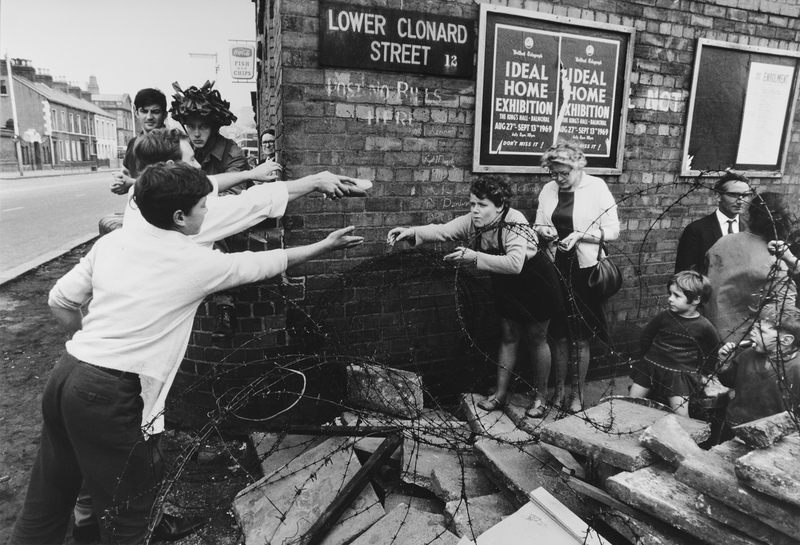 And then the use of depth of field, colour, composition (horizontal, vertical and diagonal elements) that leads the eye into these images and the utter, what can you say, engagement – no – quiescent knowingness on the children’s faces (like an old soul in a young body). This is a wondrous thing. 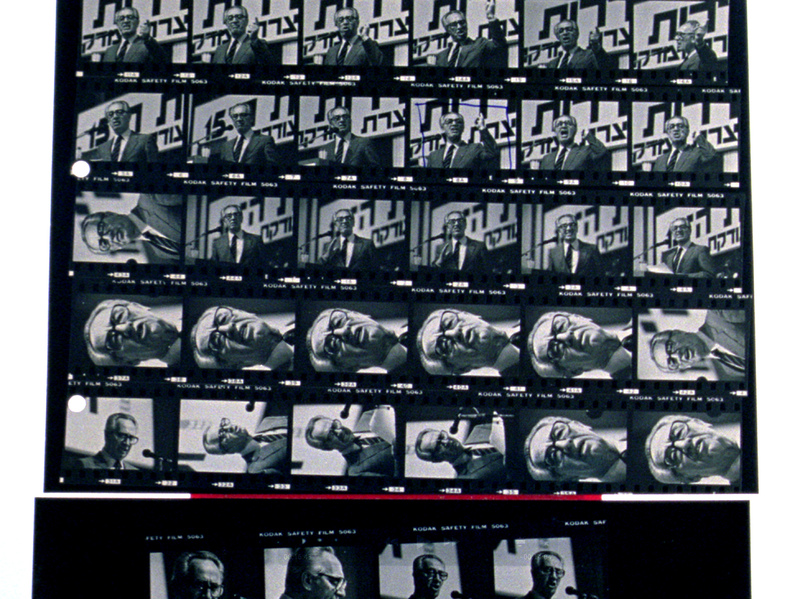 Notice how the photographer has pre-exposed the sheet of film so that the highlights in both images do not blow out. 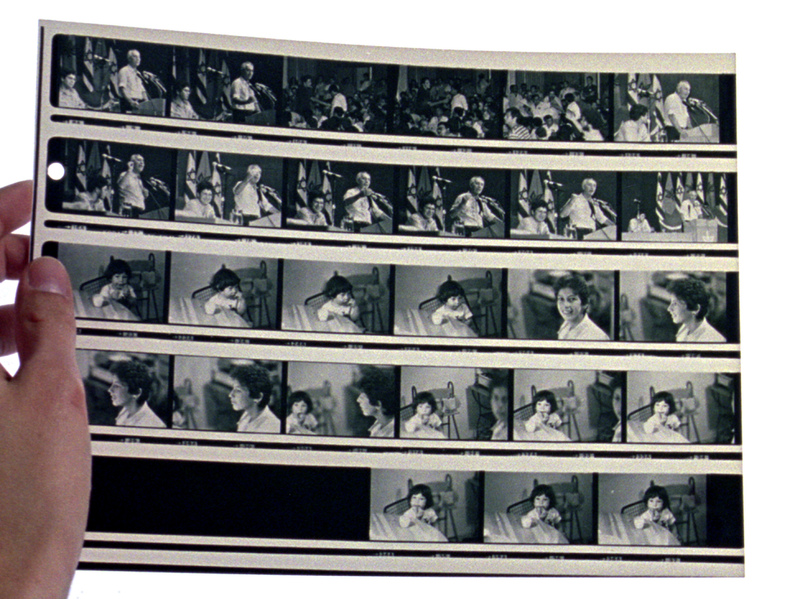 Pre-exposing the film lessens the contrast range allowing shadow detail and highlight areas to be held in balance. 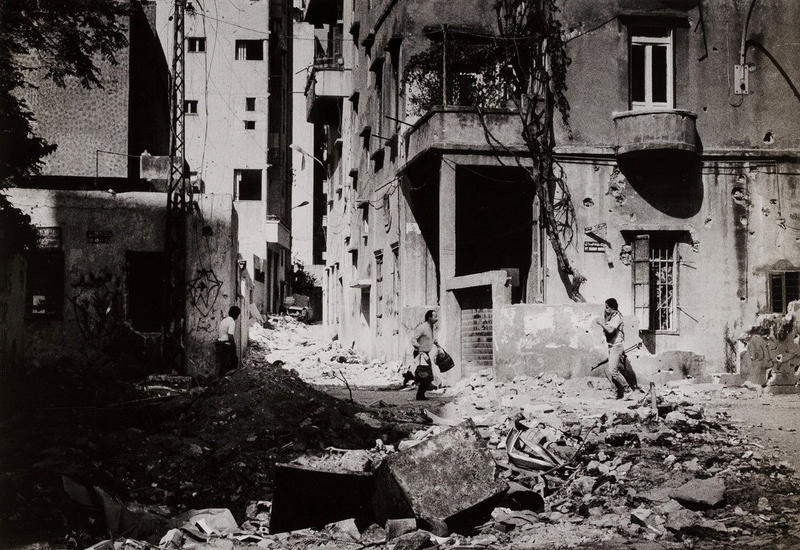 Also notice how in both images the photographer lets the eye settle in the centre of the image – in the photograph of the boy, the out of focus stairs in the distance; in the photograph of the three girls, the bonnet of the red car – before he then pulls our gaze back and to the right of the image to let the viewer focus on the faces of his subjects. In both photographs we have vertical elements (a door jam and a telegraph post) coming out of the red colours in the images and this vertically is reinforced in the image of the three girls by the rising ladder of the back of the chair. Masterful image making, this push and pull, this bravura art of creation. 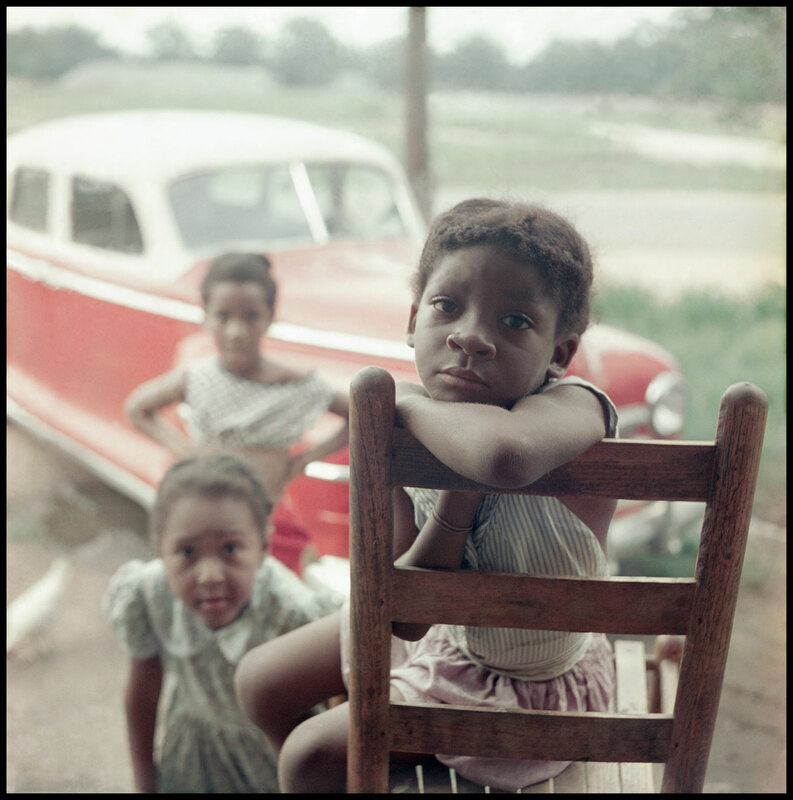 Surely, Gordon Parks ranks up there with the greatest photographers of the 20th century. 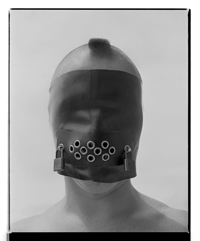 Many thankx to the High Museum of Art for allowing me to publish the photographs in the posting. 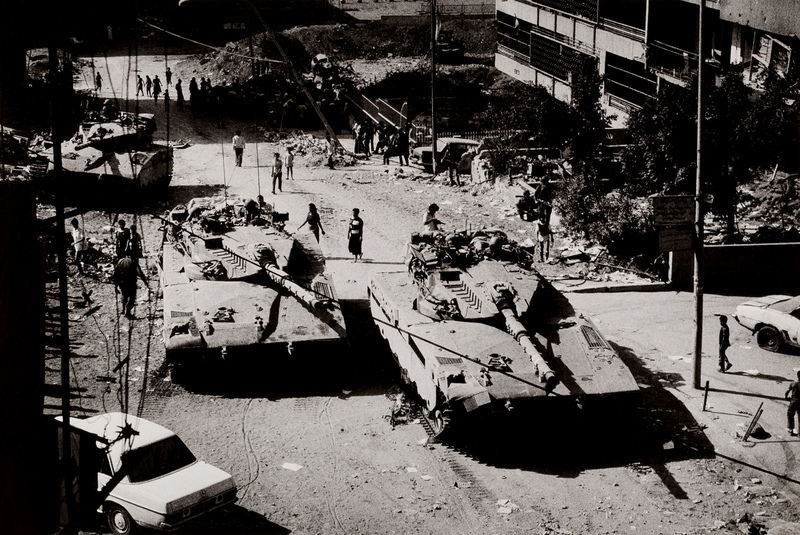 Please click on the photographs for a larger version of the image. 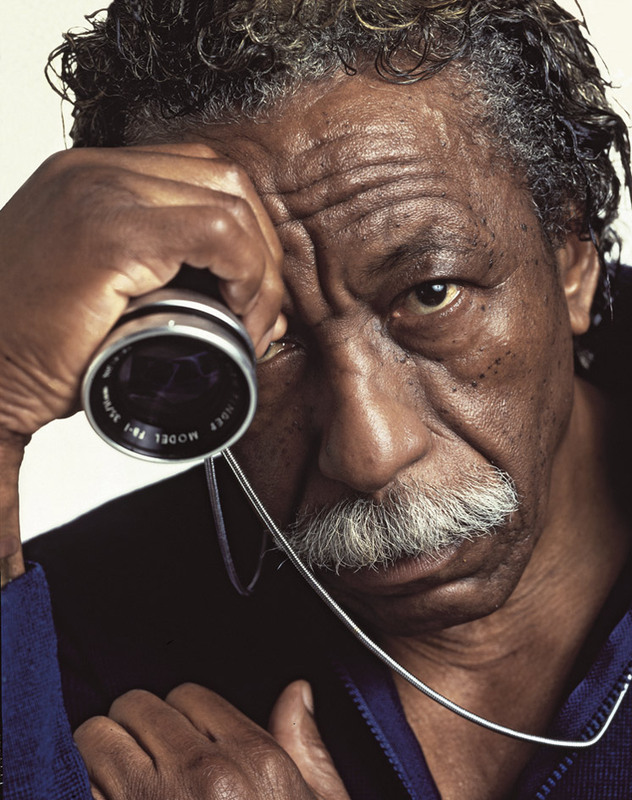 Many thanx also to Carlos Eguiguren for sending me his portrait of Gordon Parks taken in New York in 1985, which reveals a wonderful vulnerability within the artist. 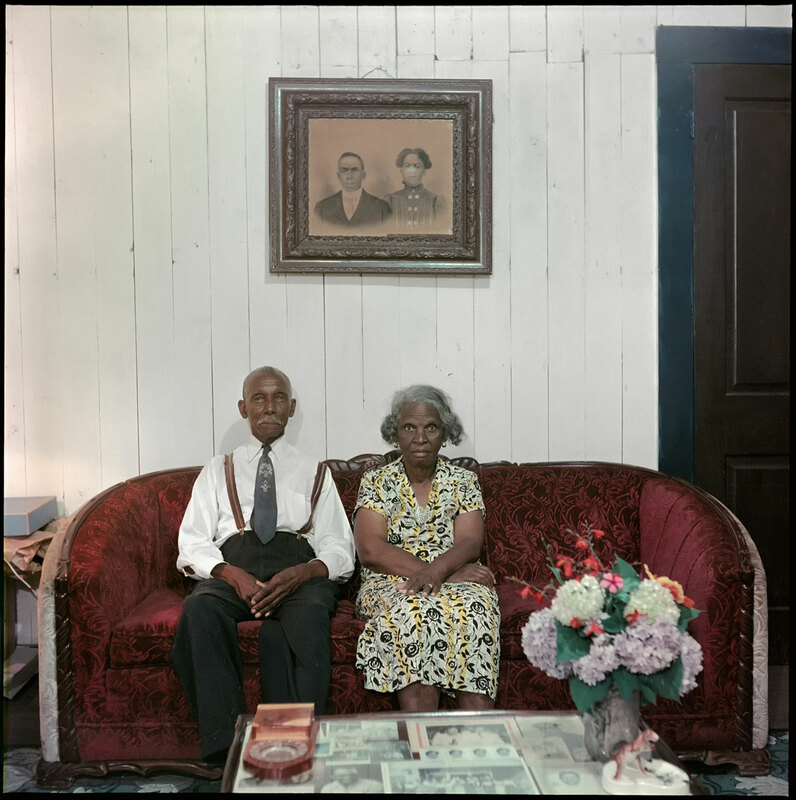 This portrait of Mr. and Mrs. Albert Thornton Sr., aged 82 and 70, served as the opening image of Parks’s photo essay. The well-dressed couple stares directly into the camera, asserting their status as patriarch and matriarch of their extensive Southern family. Photography is featured prominently within the image: a framed portrait, made shortly after the couple was married in 1906, hangs on the wall behind them, while family snapshots, including some of the Thorntons’ nine children and nineteen grandchildren, are proudly displayed on the coffee table in the foreground. Joanne Wilson, one of the Thorntons’ daughters, is shown standing with her niece in front of a department store in downtown Mobile. The pair is impeccably dressed in light, summery frocks. 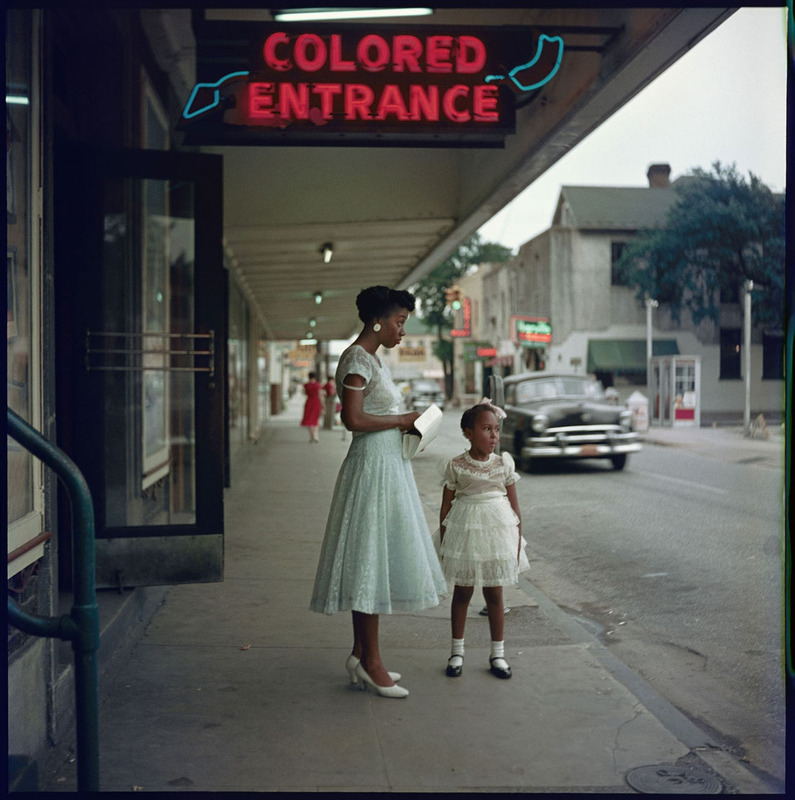 The jarring neon of the “Colored Entrance” sign looming above them clashes with the two young women’s elegant appearance, transforming a casual afternoon outing into an example of overt discrimination. Notice the fallen strap of Wilson’s slip. Though this detail might appear discordant with the rest of the picture, its inclusion may have been strategic: it allowed Parks to emphasize the humanity of his subjects. 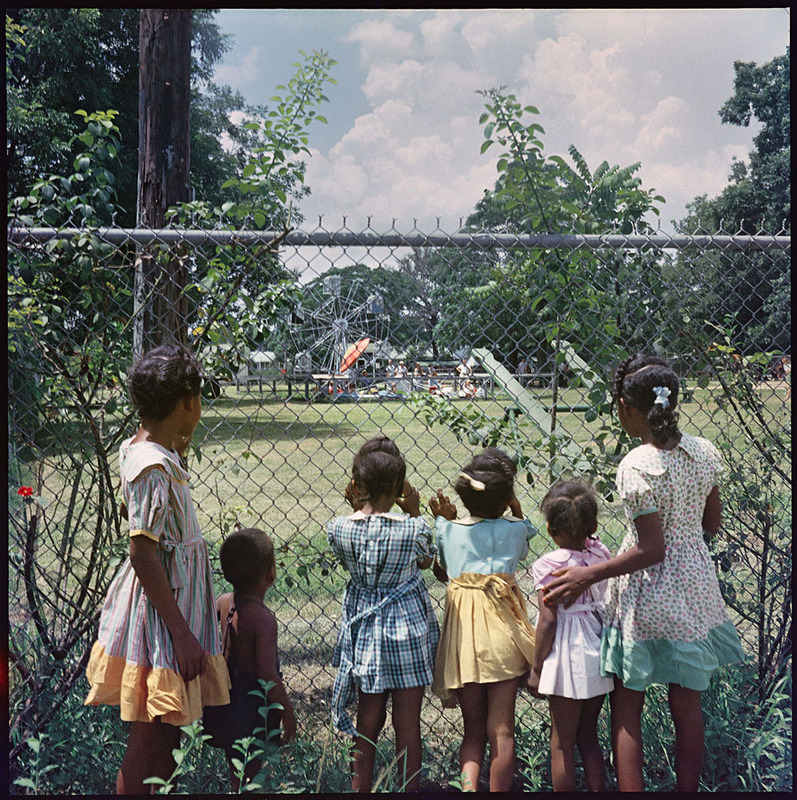 A group of children peers across a chain-link fence into a whites-only playground with a Ferris wheel. 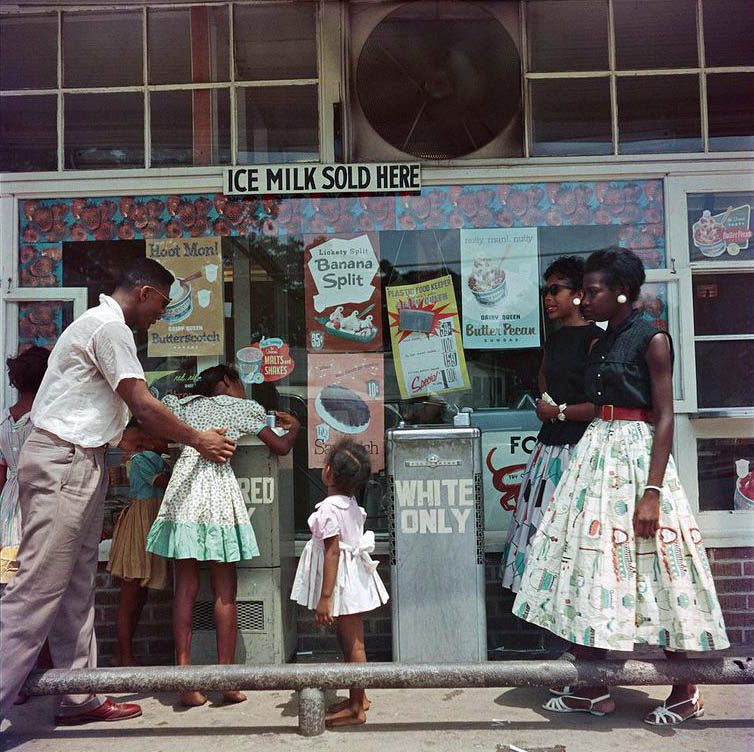 Although they had access to a “separate but equal” recreational area in their own neighborhood, this photograph captures the allure of this other, inaccessible space. The children, likely innocent to the cruel implications of their exclusion, longingly reach their hands out to the mysterious and forbidden arena beyond. 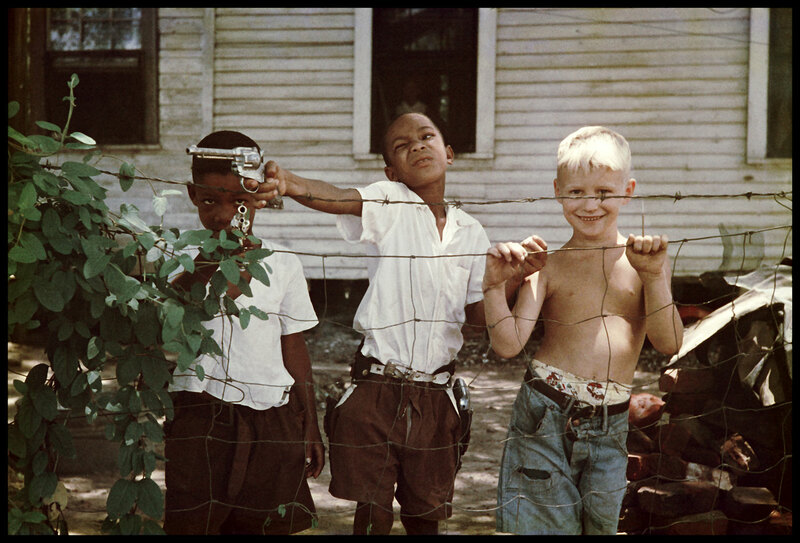 The pristinely manicured lawn on the other side of the fence contrasts with the overgrowth of weeds in the foreground, suggesting the persistent reality of racial inequality. 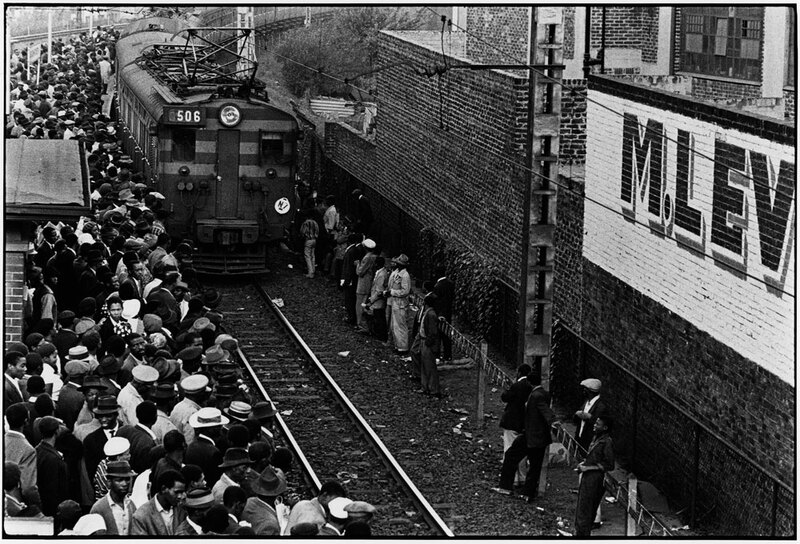 The Jim Crow laws established in the South ensured that public amenities remained racially segregated. These laws applied to schools, public transportation, restaurants, recreational facilities, and even drinking fountains, as shown here. 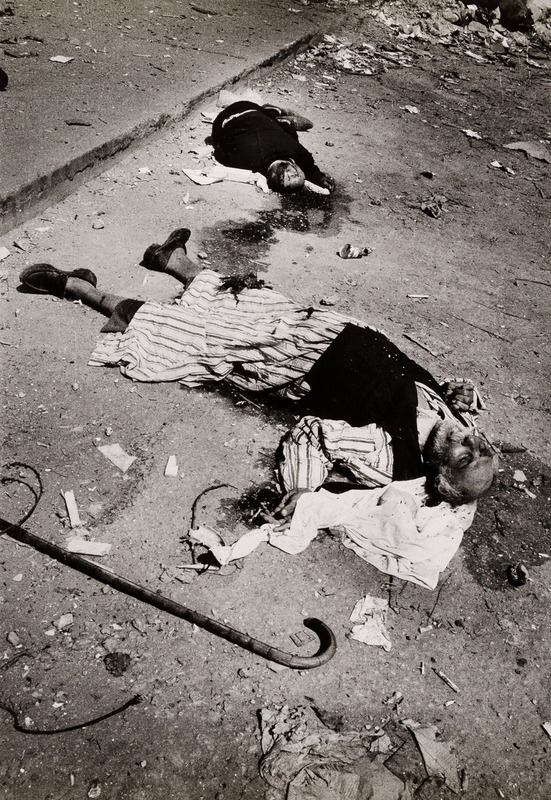 The photograph documents the prevalence of such prejudice, while at the same time capturing a scene of compassion. Here, a gentleman helps one of the young girls reach the fountain to have a refreshing drink of water. 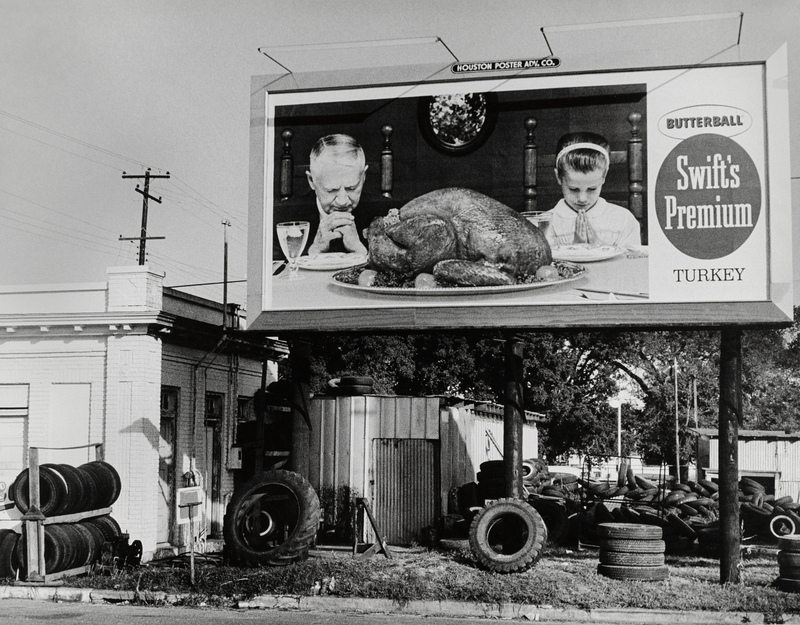 Featuring works created for Parks’ powerful 1956 Life magazine photo essay that have never been publicly exhibited. 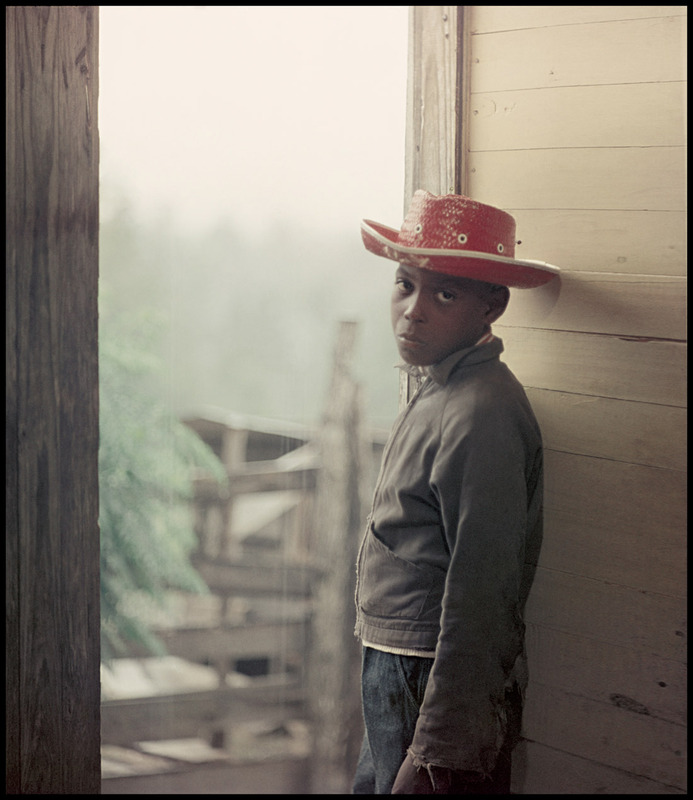 The High Museum of Art presents rarely seen photographs by trailblazing African American artist and filmmaker Gordon Parks in Gordon Parks: Segregation Story on view November 15, 2014 through June 21, 2015. 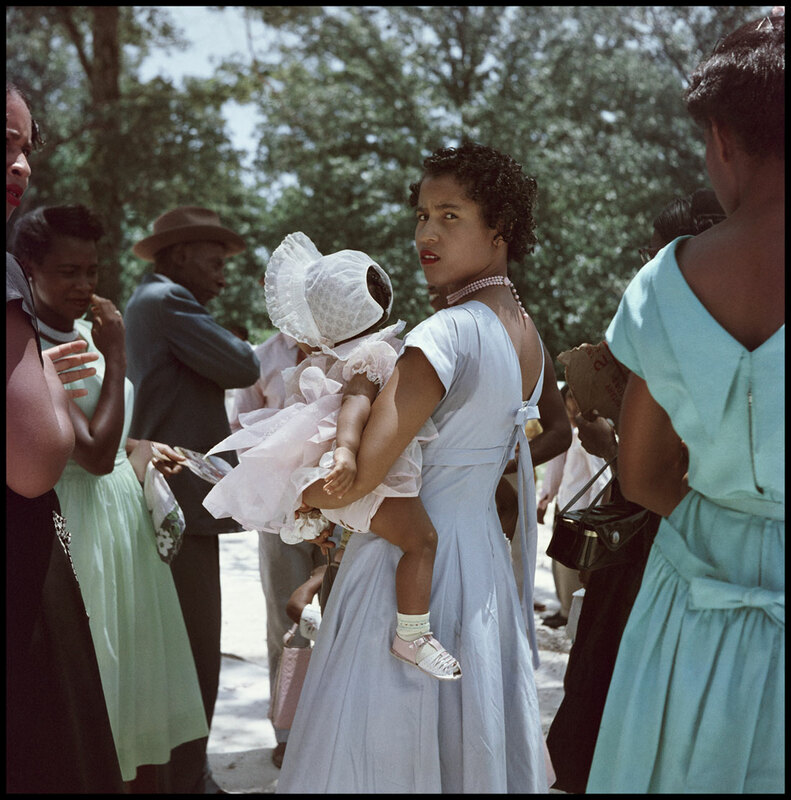 The exhibition, presented in collaboration with The Gordon Parks Foundation, features more than 40 of Parks’ color prints – most on view for the first time – created for a powerful and influential 1950s Life magazine article documenting the lives of an extended African-American family in segregated Alabama. 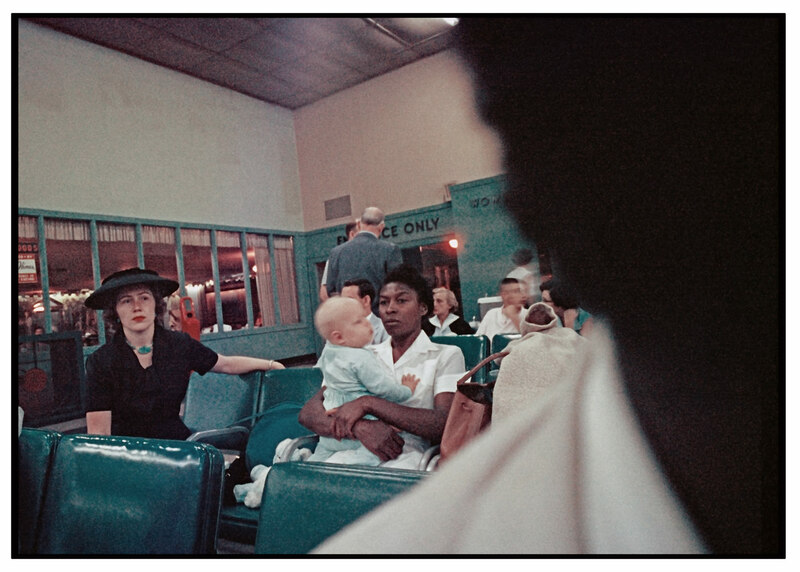 The series represents one of Parks’ earliest social documentary studies on color film. 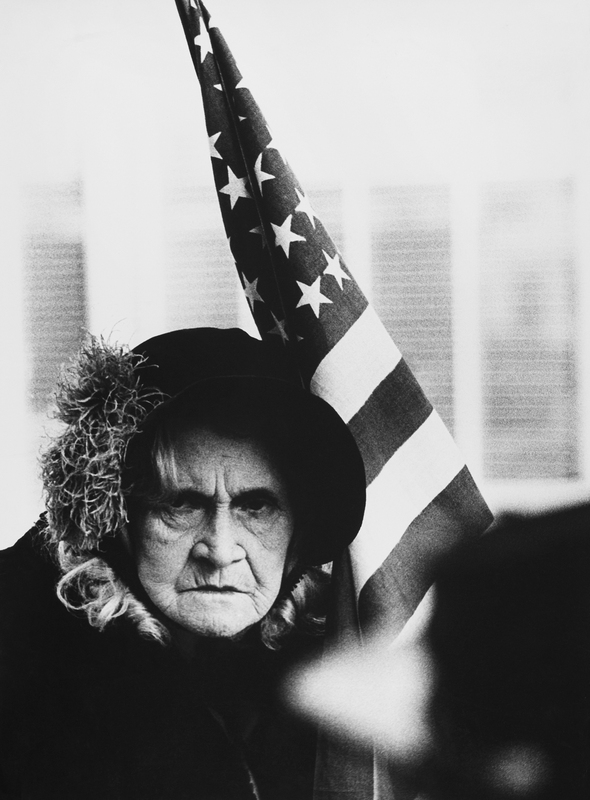 The High will acquire 12 of the color prints featured in the exhibition, supplementing the two Parks works – both gelatin silver prints – already owned by the High. 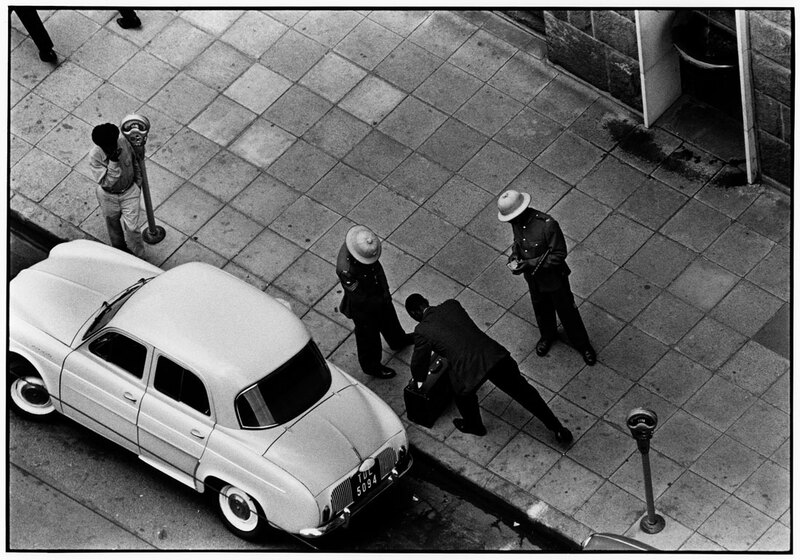 These works augment the Museum’s extensive collection of Civil Rights era photography, one of the most significant in the nation. 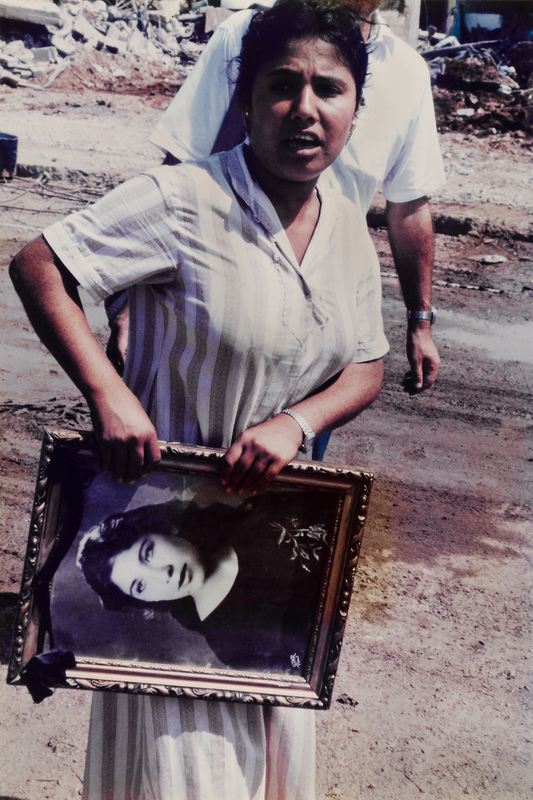 Following the publication of the Life article, many of the photos Parks shot for the essay were stored away and presumed lost for more than 50 years until they were rediscovered in 2012 (six years after Parks’ death). 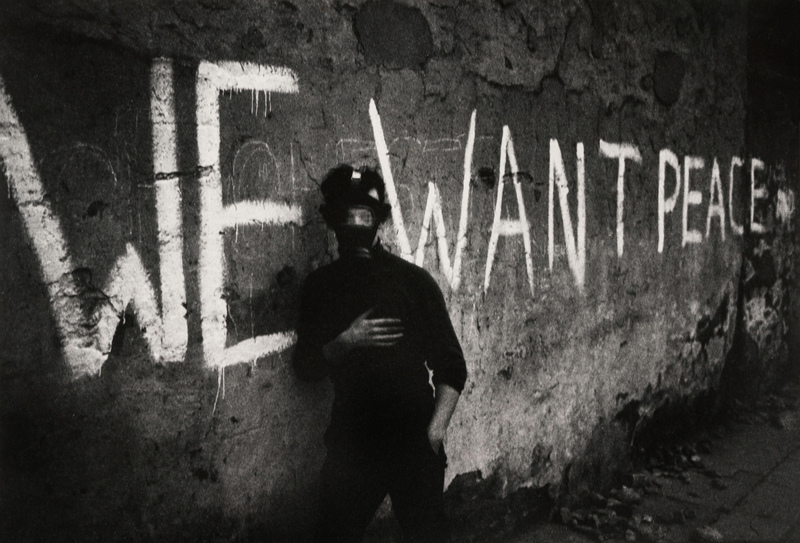 Though a small selection of these images has been previously exhibited, the High’s presentation brings to light a significant number that have never before been displayed publicly. 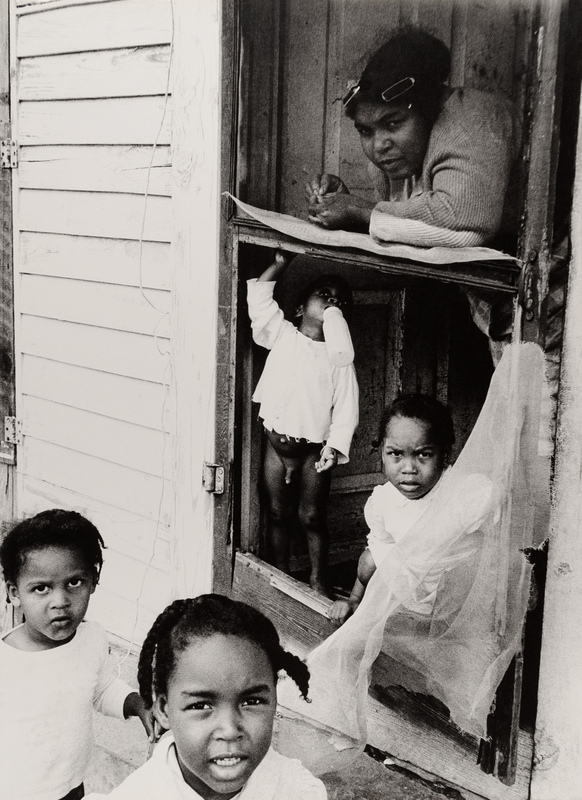 As the first African-American photographer for Life magazine, Parks published some of the 20th century’s most iconic social justice-themed photo essays and became widely celebrated for his black-and-white photography, the dominant medium of his era. 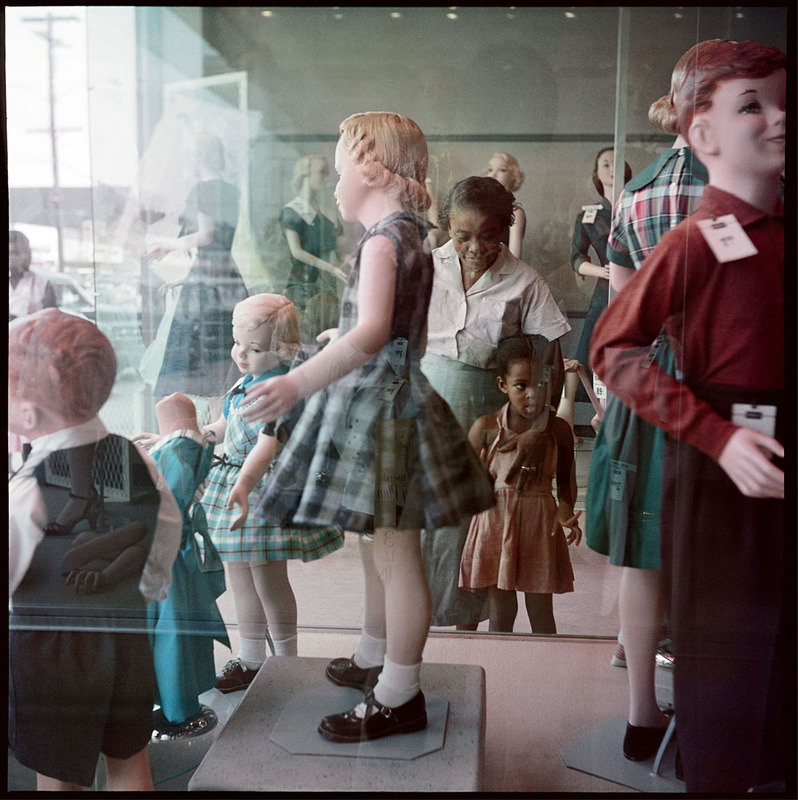 The photographs that Parks created for Life’s 1956 photo essay The Restraints: Open and Hidden are remarkable for their vibrant color and their intimate exploration of shared human experience. 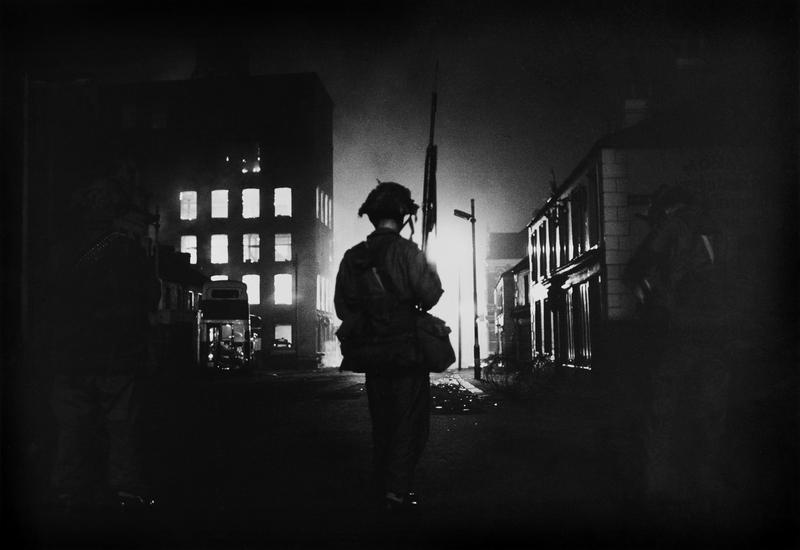 The images provide a unique perspective on one of America’s most controversial periods. 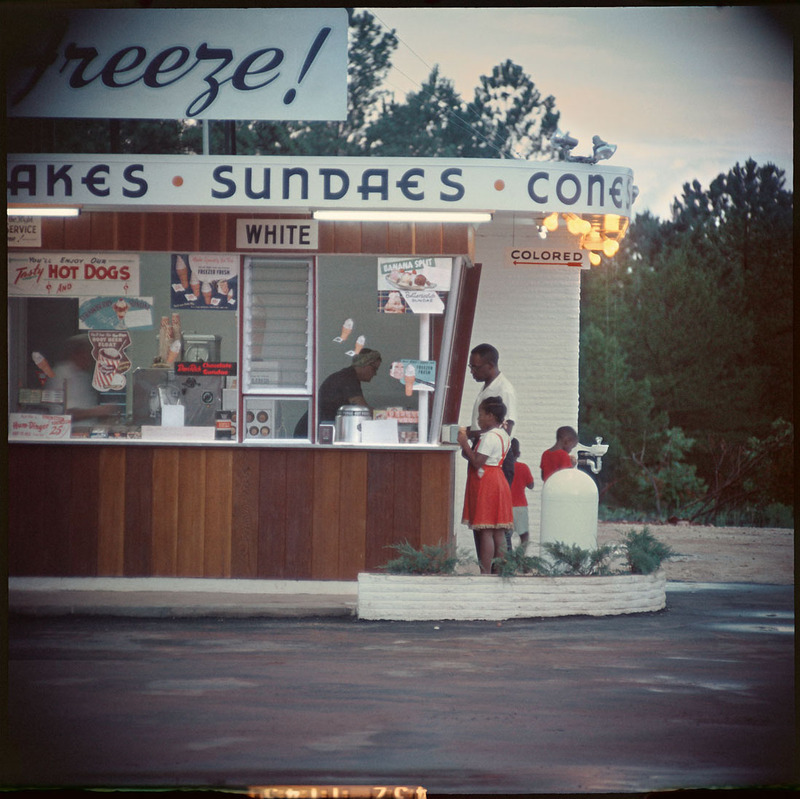 Rather than capturing momentous scenes of the struggle for civil rights, Parks portrayed a family going about daily life in unjust circumstances. Parks believed empathy to be vital to the undoing of racial prejudice. 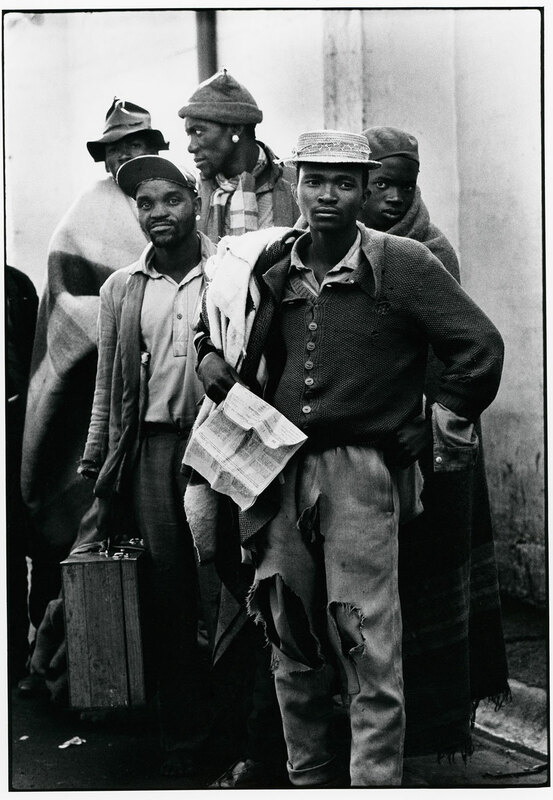 His corresponding approach to the Life project eschewed the journalistic norms of the day and represented an important chapter in Parks’ career-long endeavor to use the camera as his “weapon of choice” for social change. 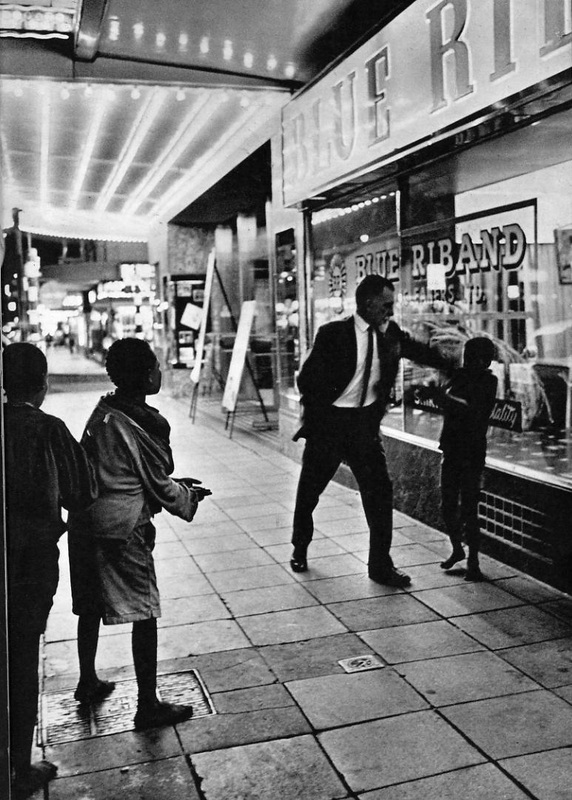 The Restraints: Open and Hidden gave Parks his first national platform to challenge segregation. 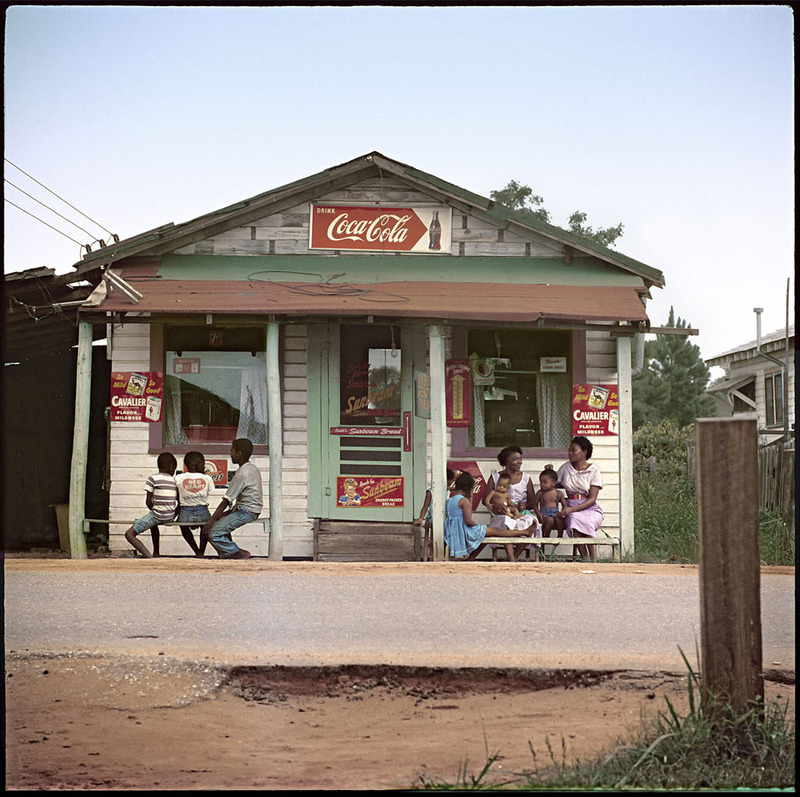 The images he created offered a deeper look at life in the Jim Crow South, transcending stereotypes to reveal a common humanity. 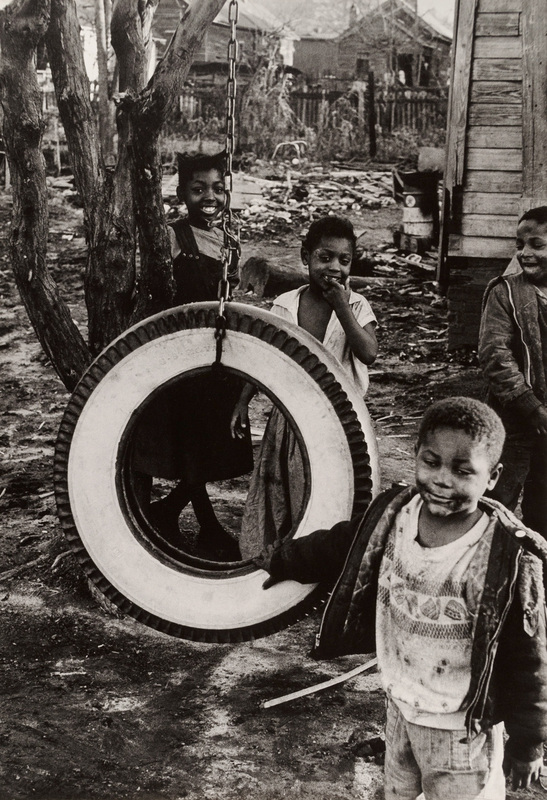 For The Restraints: Open and Hidden, Parks focused on the everyday activities of the related Thornton, Causey and Tanner families in and near Mobile, Ala. 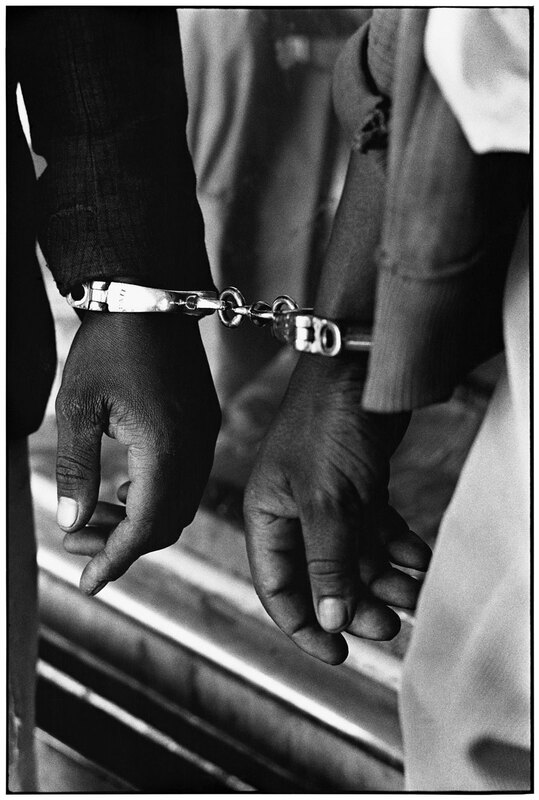 The images present scenes of Sunday church services, family gatherings, farm work, domestic duties, child’s play, window shopping and at-home haircuts – all in the context of the restraints of the Jim Crow South. 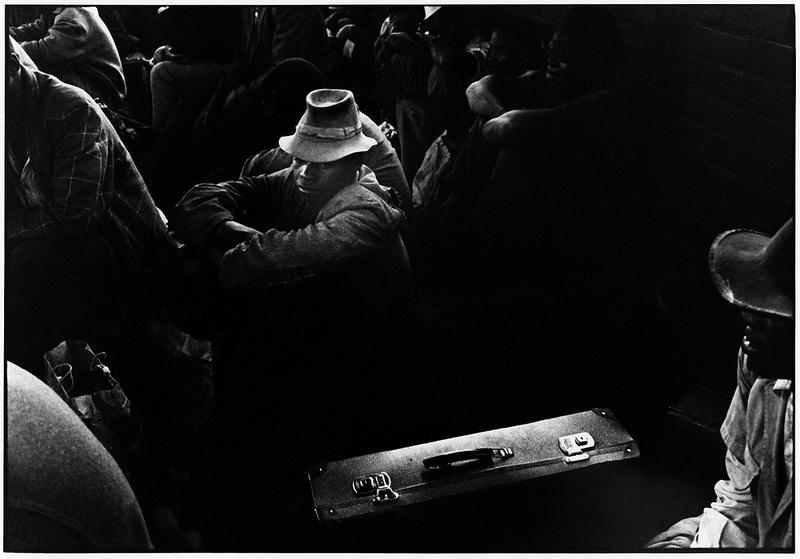 Gordon Parks was born in Fort Scott, Kansas. 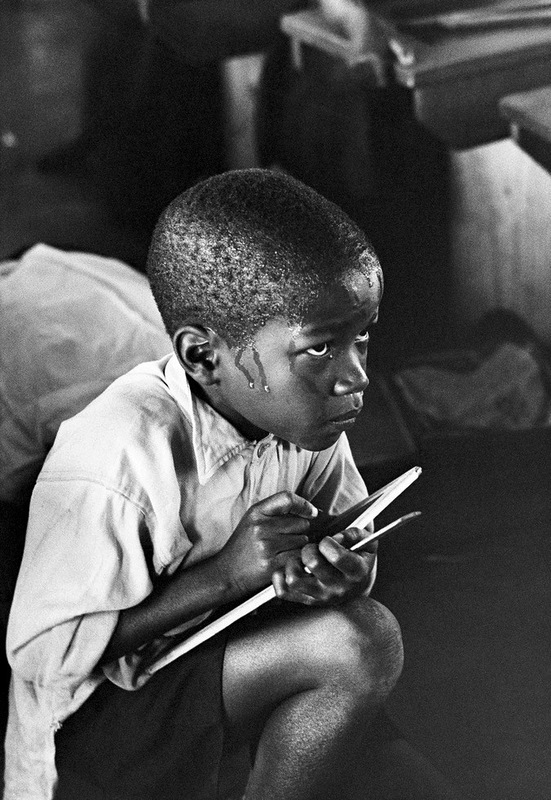 He grew up poor and faced racial discrimination. 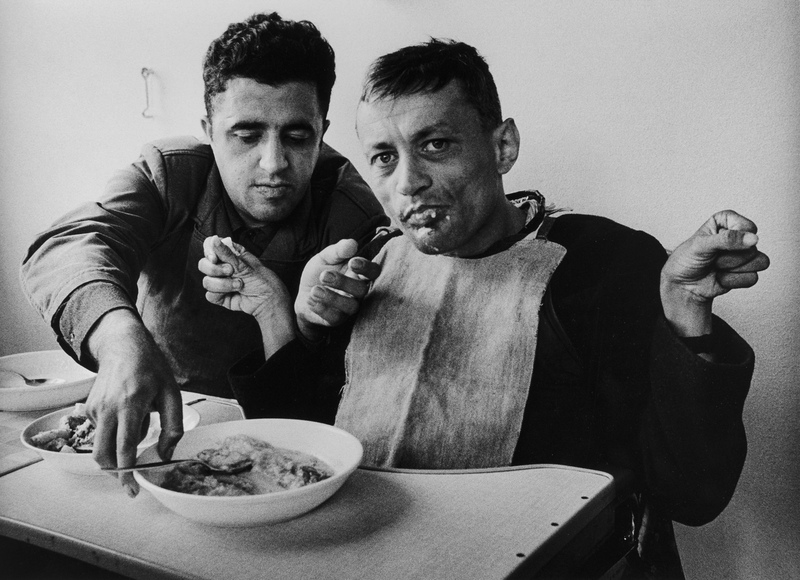 Parks was initially drawn to photography as a young man after seeing images of migrant workers published in a magazine, which made him realize photography’s potential to alter perspective. 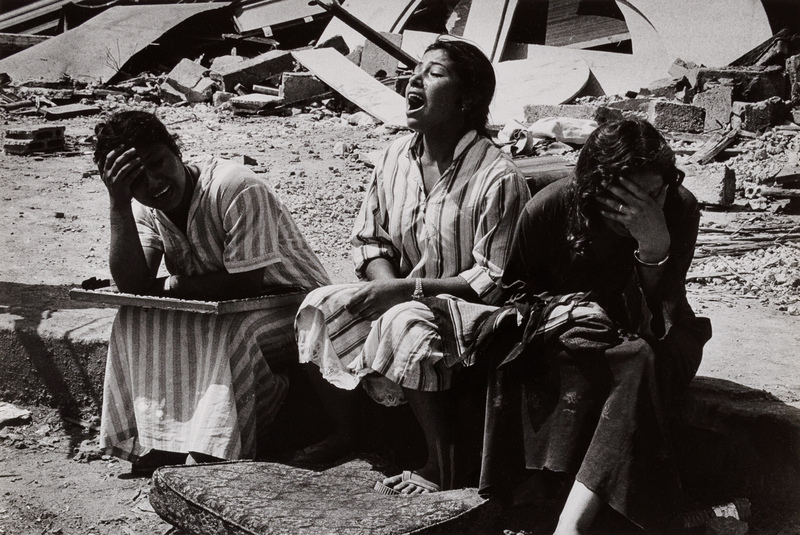 Parks became a self-taught photographer after purchasing his first camera at a pawnshop, and he honed his skills during a stint as a society and fashion photographer in Chicago. 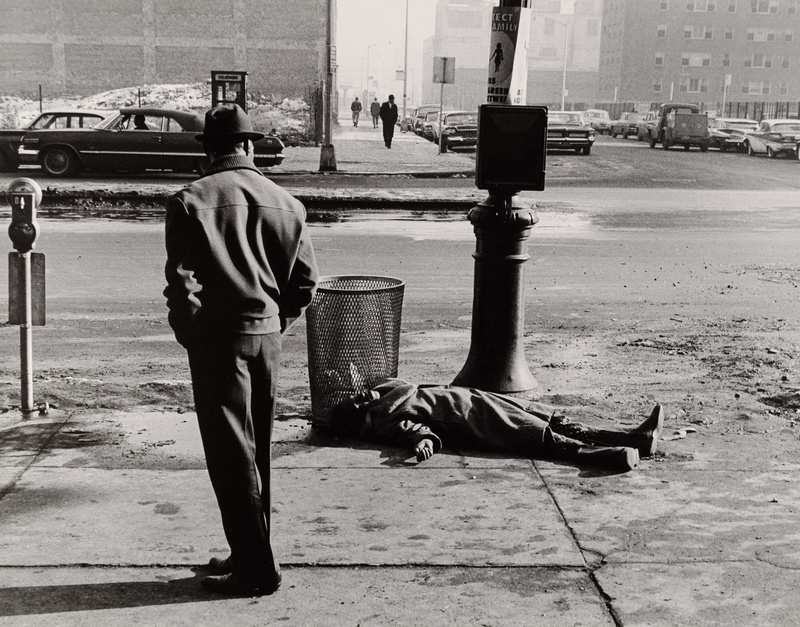 After earning a Julius Rosenwald Fellowship for his gritty photographs of that city’s South Side, the Farm Security Administration hired Parks in the early 1940s to document the current social conditions of the nation. 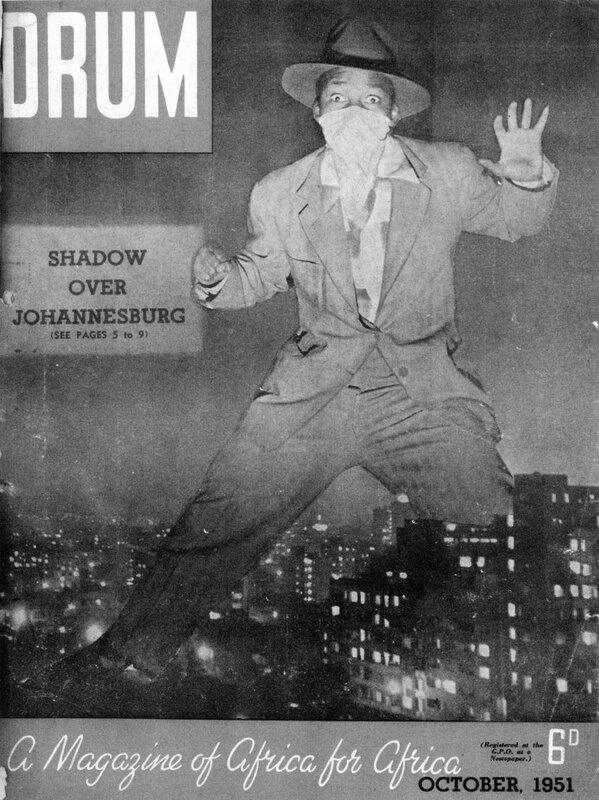 By 1944, Parks was the only black photographer working for Vogue, and he joined Life magazine in 1948 as the first African-American staff photographer. In 1970, Parks co-founded Essence magazine and served as the editorial director for the first three years of its publication. Parks later became Hollywood’s first major black director when he released the film adaptation of his autobiographical novel The Learning Tree, for which he also composed the musical score, however he is best known as the director of the 1971 hit movie Shaft. Parks received the National Medal of Arts in 1988 and received more than 50 honorary doctorates over the course of his career. 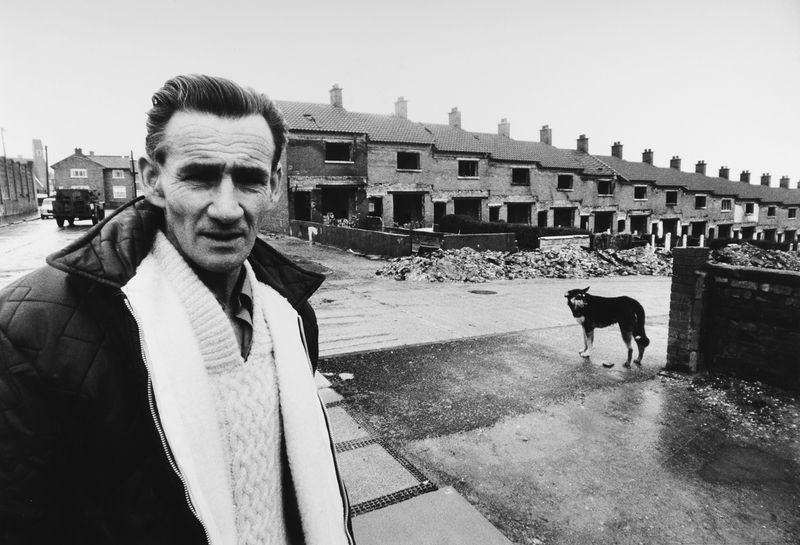 He died in 2006. Although this photograph was taken in the 1950s, the wood-paneled interior, with a wood-burning stove at its center, is reminiscent of an earlier time. 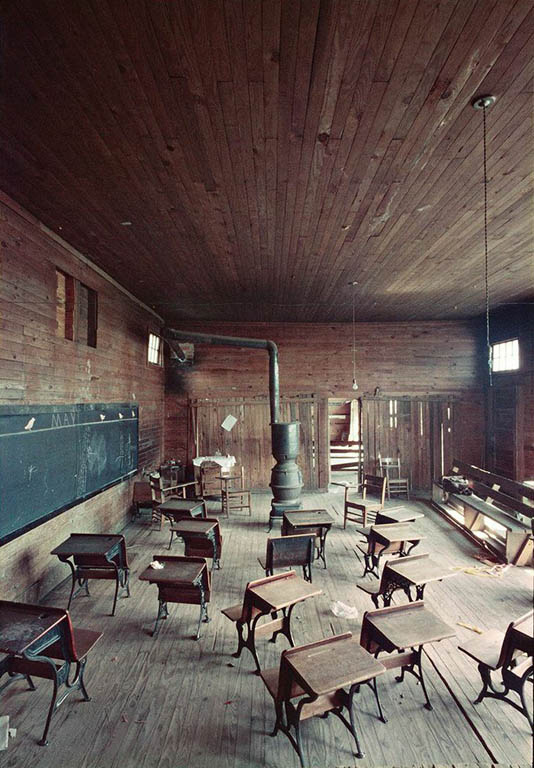 Parks’s photograph of the segregated schoolhouse, here emptied of its students, evokes both the poetic and prosaic: springtime sunlight streams through the missing slats on the doors, while scraps of paper, rope, and other detritus litter the uneven floorboards. One of the Thorntons’ daughters, Allie Lee Causey, taught elementary-grade students in this dilapidated, four-room structure. After Parks’s article was published in Life, Mrs. Causey, who was quoted speaking out against segregation, was suspended from her job. She never held a teaching position again.